We have been developing our appreciation for rhythm and rhyme in speech. We have played lots of rhyming games and have used body percussion to help us to notice the rhythm in words and sentences. We have loved making silly chilly soup! 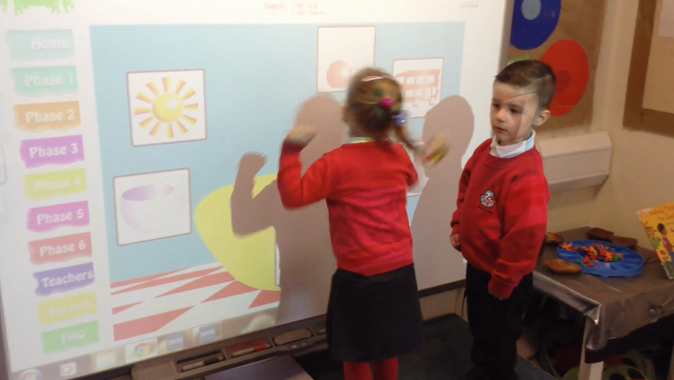 The children took turns to choose an object to go into our rhyming soup. We 'bounced' the words on each hand to hear them side by side, which helped the children to hear if the words sounded the same. They all had a turn at stirring the soup while singing "We're going to make some silly soup, we're making soup that's silly. We're going to cook it in the fridge to make it nice and chilly!" When the soup was ready we all got to taste it, it was ever so cold! This is a fantastic interactive game on the phonics play website and is very similar to silly soup. The children have loved making rhyming birthday cakes, making sure that all the ingredients sounded the same! This is a great activity for developing children's awareness of rhythm in spoken words. We gathered a range of objects and took turns to say the object names in different ways, slowly, fast, low, high and in a variety of strange voices. We also used body percussion, clapping, tapping or stomping the syllables in each word.